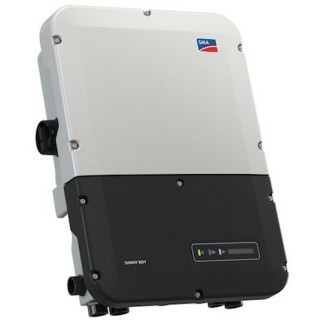 The Sunny Boy Storage SBS5.0-US-10 is a single phase, AC-coupled battery inverter designed for parallel grid operation that can be used with industry-leading, high-voltage batteries such as LG Chem and Tesla Powerwall. The Sunny Boy Storage SBS5.0-US-10 AC-coupled architecture will enable installation at any time. The inverter has (3) 10A independent battery inputs which allows you to vary the brand of battery you wish to use providing flexibility and scalability. These three inputs can also be run in parallel allowing for (1) 30A input on the DC side. Along with its ability to retrofit existing PV systems, it also delivers the most cost effective, versatile and innovative residential storage solution available. As with other SMA inverters, the SBS5.0-US-10 is also equipped with a Secure Power Supply** feature allowing up to 2000W of convenience power in the event of a grid outage during both day and night. This transformerless inverter has a maximum efficiency of 97.5% and includes arc-fault protection and an integrated DC Disconnect. Plus, it is easily connected to the internet via Ethernet/WLAN through Webconnect and then it can be monitored through the SMA Sunny Portal. **NOTE: Secure Power Supply operation in Flexible Storage Systems with backup power supply not possible. If the inverter is used in a battery-backup system and connected with an automatic transfer switch, the secure power supply operation is not available.